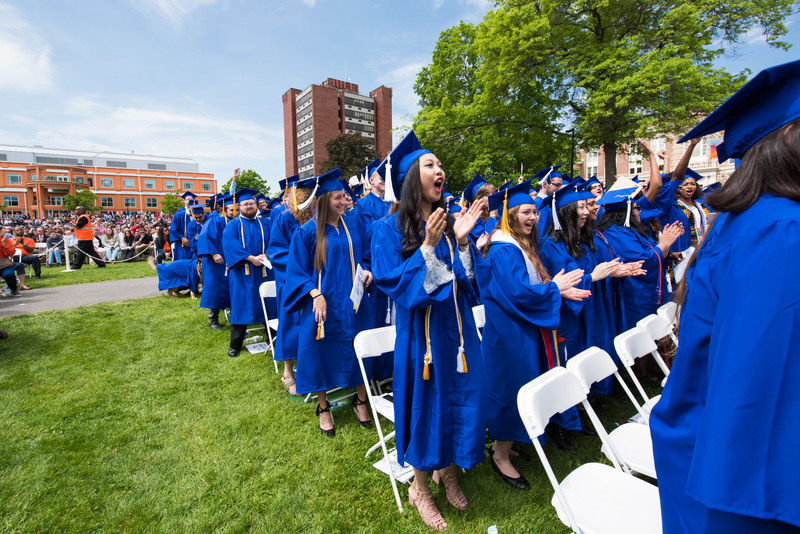 The newest alumni of the SUNY New Paltz Schools of Business, Education, Fine & Performing Arts and Science & Engineering celebrated their achievements with families, friends, faculty mentors and professional colleagues at the Sunday Undergraduate Commencement Ceremony, on May 21. 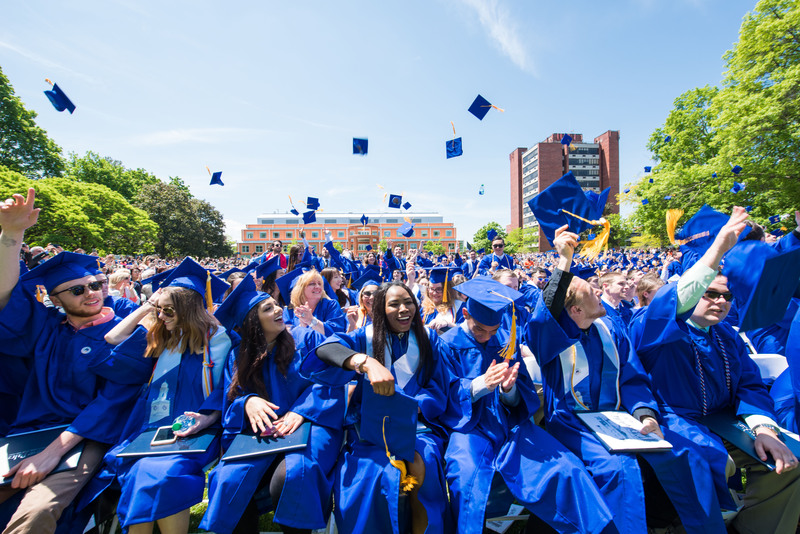 Nearly 2,000 total undergraduate degrees were distributed over the course of a two-day Commencement weekend on the New Paltz campus, as students representing the graduating classes of August 2016, December 2016, January 2017, May 2017 and August 2017 took advantage of the once-in-a-lifetime opportunity to don cap and gown and be recognized for their hard work. The Sunday Ceremony graduates earned their degrees through years of preparation for careers or graduate study as teachers, engineers, artists, musicians, researchers, entrepreneurs, accountants and a host of other rewarding occupations. Among the graduates are the first six New Paltz students to complete the College’s new program in mechanical engineering. The 2017 Commencement graduates come from diverse backgrounds and are looking forward to a wide variety of lives and careers, but will forever have this place and this time in common. “Graduates, we have tried to prepare you with knowledge, intellectual and personal attributes, and a desire to keep learning throughout your life,” said President Donald P. Christian. “As you go forth to take up the responsibilities of graduate or professional school, employment, family and community, your college is proud of your accomplishments so far, and eagerly anticipates what you will achieve in your future. The Commencement Address at the Sunday Ceremony was given by Michael Keegan, a banking executive and current chair of the SUNY New Paltz Foundation Board. “I stand before you the beneficiary of a public university education, and I know many of you have travelled a similar or an even more challenging path,” Keegan said. “I have met New Paltz first-generation college students, community college transfers, students working multiple jobs and fighting against so many obstacles. You inspire me and all of us gathered here today. Student Speaker Jessica Weeks ’17 (Biology), of Danbury, Conn., who is preparing to attend medical school this fall, reflected on the value of a college education, and the responsibility that comes with it. “Today is a beautiful day – a day of gratitude, a day of honoring our connections to others, and a day of moving forward to create a more compassionate world,” Weeks said. “We are empowered by the education we earned here. With higher education comes the opening of doors and opportunities not experienced by most. In the moments before they walked across the stage, some new graduates took a moment to reflect on their experiences at New Paltz, and what comes next. 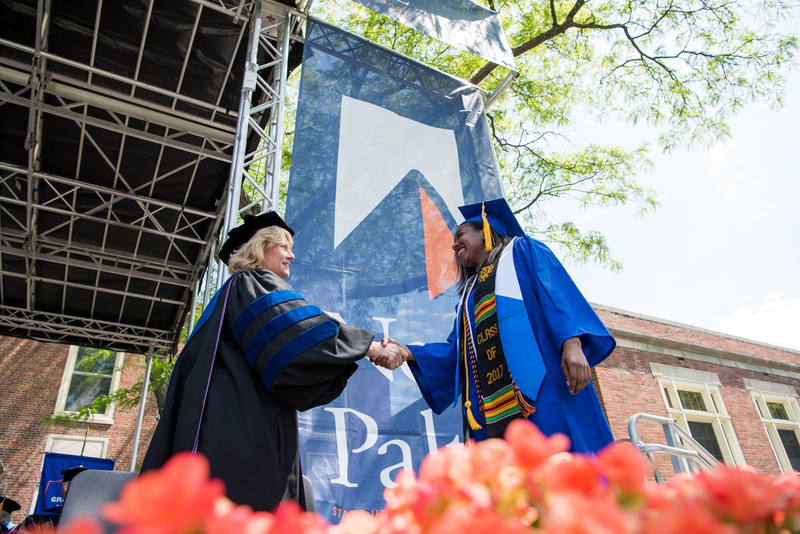 The Sunday Ceremony was part of a weekend-long celebration of New Paltz students’ academic fulfillment, as more than 2,500 graduate and undergraduate degree recipients were honored at Commencement ceremonies held on May 19, 20 and 21. Complete coverage of SUNY New Paltz Commencement activities is available at https://sites.newpaltz.edu/news/category/commencement/.